I’m sure fictitious bands are a fun concept for the musicians writing the material, but I could care less if it's Tim Armstrong behind the mic or “Bagga” – they both sound the same. 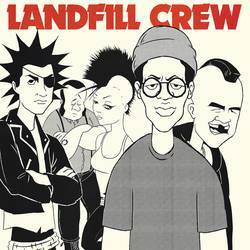 There are animated videos for this 4-song EP that develop the storyline of a fake 1980s punk band, which is the concept behind Landfill Crew. I’m not going to review the videos, though, because it’s not part of the physical package. And that’s where I’ll quit with the storyline and concept because while the story takes place in the 1980s, this sounds like turn of the century reggae-punk all the way. Fans of Rancid’s Life Won’t Wait and the Hellcat Records Give ‘Em the Boot II compilation that features punk-backed songs with reggae-fronted vocals should take note as it’s the core style at play with Landfill Crew, which also features reggae singer Tippa Lee (aka “Hux”) and J Bonner as members. While punk is at its heart and with a lot of my own hyphens in this review already, it’s not a straight-up hybrid punk sound. The opening eponymous track is more of a pop jam with a reggae breakdown and Tim Armstrong’s one-of-a-kind drawl. The second track, “Youth Revolt,” picks up the tempo/aggression a bit more, sounding more like that Life Won’t Wait reference from earlier. It’s mid-tempo punk that shifts between singalong chorus and reggae with punk guitar mixed subtly in the back. The dynamics shift based on the vocal style. “Poets in the Night” maintains that same style, though the punk influence is more tempered again, perhaps more similar to The Transplants than Rancid in that regard, while the song features a more traditional reggae vibe overall. Then, the final song, “Worldwide Warfare,” sets a darker tone with a classic Rancid sound. This song captures the record’s theme the best, about a crew of misfits drinking their troubles away as the world burns around them. It also merges the different musical worlds the best: the repetitive Armstrong-penned choruses and breakdowns balances between Tippa Lee’s vocals, keeping his familiar riddim but subtly adapting to the more forward-pushing tempo of the punk guitars. This is a fun EP for people who follow the Rancid deep cuts, but it also feels like a one-off. Anyone interested in both punk and contemporary reggae might be interested to see where the two styles meet. But traditionally speaking, it’s far more punk than it is reggae, carried more by rock guitar and melody than by rhythm. This feels like a spin-off pilot more than a full-fledged band. It’s enjoyable for what it is, but it will probably be forgotten with time except to the already dedicated followers of the players involved. Posted March 25, 2019, 5:56 p.m.
Posted Feb. 2, 2019, 10 a.m.